Mitchell-Innes & Nash presents Positive Pathways (+), an exhibition of works by artist collective GCC. This is the group’s debut show at Mitchell-Innes & Nash and their first in the United States since GCC: Achievements in Retrospective at MoMA PS1 in 2014. The exhibition, which includes installation, wall sculptures and sound, focuses on the increasingly pervasive trend of Healthy Living and Positive Lifestyles gaining momentum in the Middle East. In particular, GCC explores the ways in which these lifestyle attitudes are appropriated, employed, and transformed as part of a greater political mechanism. The exhibition at Mitchell-Innes & Nash expands upon GCC’s 2016 project at the most recent Berlin Biennale, a sculptural installation of a woman and child. 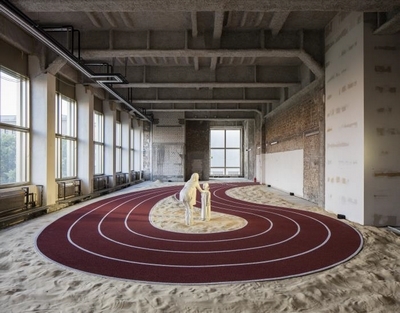 The woman is performing a Quantum Touch exercise, a non-contact touch therapy that became popular in the West in the late 1990s, on a boy as they stand on sand surrounded by a running track. The work, from where the exhibition borrows its title Positive Pathways (+), focuses on the ways that the positive energy movement and body healing practitioners have become co-opted by governments in the region – such as the creation of new ministerial positions like the UAE’s Ministry of Happiness, and the emergence of life coaches and Feng Shui consultants employed by hereditary leaders. Also on view will be a set of sculptural reliefs created using Thermoforming, a commonly used industrial process where thermoplastic sheets are heated and formed on a mold. The reliefs are based on 3D renderings of stills taken from YouTube videos and images found online of regional practitioners promoting the positive energy movement. Ranging from politicians to social media celebrities to TV clerics, these individuals utilize the Positive Energy attitude as a base for state policy. Referring to the erasure and creation of cultural myths, these reliefs create narratives of the present, a mechanism of both nation building and the politics of cultural extinction and creation. GCC, an acronym that does not necessarily stand for but alludes to the Gulf Cooperation Council (the intergovernmental political and economic partnership that connects six countries in the region), is an artist “delegation” or collective composed of eight members, all of which have strong ties to the Arabian Gulf region of the Middle East. The group was formed in 2013 at Art Dubai and has since shown at Kraupa-Tuskany Zeidler in Berlin; Project Native Informant in London; The New Museum, Whitney Museum of Art, and MoMA PS1 in New York; Musée d’Art Moderne in Paris; 9th Berlin Biennial; Sharjah Art Foundation, UAE; Fridericianum in Kassel; and Brooklyn Academy of Music in New York.